How can it be that Switzerland are seeded ahead of Italy, runners-up in Euro 2012 and third place in this year's Confederations Cup? And anyway, are the current rankings the best way to determine World Cup seedings? Surely it would be better to give some weight to past performances in the competition? These are all valid questions. But it could be that on this occasion their importance is being over-stated. In the 2014 World Cup draw, taking place in Brazil this Friday, other factors could prove at least as significant as the choice of group opponents. Location and kick-off times of the matches will be every bit as crucial. This is a clear consequence of staging a World Cup in a country the size of a continent - and also of trying to ensure the matches take place at a convenient hour for the European TV audience. Things might be a little easier had the original idea been maintained; early thinking was this World Cup would return to the system used in competitions of old, where the country would be divided into regions, in which teams would be based for all of their group matches. It would cut down on travelling, and ease the burden on Brazil's airport capacity, long seen as the weak point of the 2014 project. But such common sense made no political sense. As the bill for staging the tournament kept rising, the idea of one region monopolising all of Brazil's matches became politically unfeasible. If the whole country was paying for it, the whole country wanted a chance to see its own team. So the hosts are travelling around - Sao Paulo in the south-east, Fortaleza up in the north-east and Brasilia in the centre. And if Brazil are criss-crossing the country, so is everyone else. But some will be clocking up many more air miles than others. And allowances also have to be made for the fact this is a winter World Cup in a land where the season can bite hard in the south, but leave the tropical north-east entirely untouched. There will probably be massive temperature differences between some of the host cities - a problem exacerbated still further by the kick-off times. Through the group stages, Fifa likes to have matches starting at three different hours, and wants all of them to be accessible for Europe. This time the kick-off times are 17:00, 20:00 and 23:00 BST for the first 10 days, then 17:00 and 20:00 for the end of the group phase, the second round and the quarter-finals. At local times here in Brazil, that means the ball is due to get rolling at 13:00, 16:00 and 19:00. The controversy is in those early starts. There is not the slightest problem in the 13:00 kick-offs in the southern cool of Porto Alegre and Curitiba. But up in the north-east it is a different story. In the likes of Salvador, Natal and Fortaleza, the substitutes will work up a sweat merely watching from the bench. Those playing will be getting a free sauna. Fifa president Sepp Blatter recently hinted the world governing body might take a look at the 13:00 kick-offs. There is some room for manoeuvre, days for example when an early kick-off in Recife could be swapped over with a late one in Curitiba. But the basic point remains; in order to fit in three match times per day it is all but inevitable that some early matches will take place in sweltering temperatures. And some will still be feeling the heat in the 16:00 starts in the north-east. Luck of the draw, then, will play a huge part in World Cup preparations. The seeded teams will surely be delighted to be drawn in Group H; they will play in Belo Horizonte, Rio de Janeiro and Sao Paulo, three cities clustered in the south-east region with mostly mild weather in June and July. Indeed, this would be a good group for a European team. Teams H3 and 4 have to trek out west for the opening match in Cuiaba, but otherwise all the games take place in the south or south-east. It is the only group which does not go to the tropical north east. Group B would also be a favourable option in this respect. The seeded team in Group G will have done well in terms of travelling time; all its matches are in the same region. But they are based in the north-east, and with 13:00 kick-offs in Salvador and Recife either side of a 16:00 start in Fortaleza, the players will have to be prepared for extreme heat. It would be fine for Colombia, but not so good, say, for Switzerland. And then, should they win the group, they need to get ready for a thermic shock - the first knockout game is down south in Porto Alegre. Some sides will be forced to undertake journeys of epic proportions. Brazil's first opponents will open the competition in Sao Paulo, then make the huge 2,500-mile trek to Manaus in the Amazon before returning part of the way to close their group campaign in Recife. 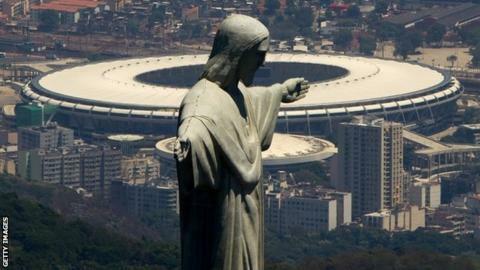 Brazil 2014, then, will be a World Cup where luck of the draw, combined with good logistical planning, will be an essential component of victory. Send questions on South American football to vickerycolumn@hotmail.com, and I'll pick out a couple for next week. I was a bit surprised he wasn't recalled in the last Brazil squad. His team-mate Robinho got in instead, in large part because coach Scolari wanted to have a look at him the 'false nine' role. But Scolari frequently points out that his squad lacks experience, and you might imagine that off the field Kaka would have more to offer than Robinho in terms of helping the younger players cope with World Cup pressure. There is only one Fifa date to go before squads are announced (Brazil play South Africa in March), but then again Kaka hardly needs to be tested. If he can maintain current form I think a squad place is a serious possibility - but unless there are plenty of injuries it's hard to see him starting the World Cup in the team. He's been the star player in this year's Brazilian Championship, a left-footed attacking midfielder who has played a key role in his team coasting to the title. He's had a strange career. He was Brazil's left-back in the 2009 South American Under-20 Championships. But he didn't do well, lost his place in the team and was left out of the squad altogether for the World Cup at that level later in the year. At the time he was with Corinthians, who loaned him out here and there, didn't seem to think much of him and let him go to Coritiba - where he reinvented himself as a midfielder. I think he's one of those players who has benefited from the tactical switch to 4-2-3-1. He can search for space across the line of three, and then showcase his tight dribbling and ability to thread a pass. But after a couple of interesting campaigns with Coritiba, no-one really imagined that he was capable of being as decisive as he has proved with Cruzeiro - and some doubt that both he and his team will be able to sustain this year's form. In terms of adaptation to English football, he would clearly find the intensity and reduced space of the game a challenge. But I think it's all academic. I can't see any basis on which he would be awarded a work permit.